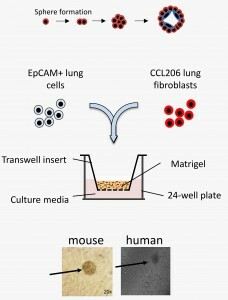 Lung organoids provide a model system to study processes of repair/regeneration of lung epithelium. Defective alveolar repair as observed in COPD can be recapitulated using this model. 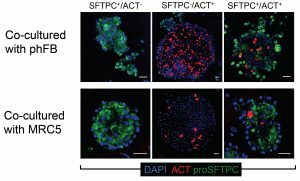 Organoids of alveolar epithelial cells in co-culture with fibroblasts can be used to evaluate efficacy of investigational compounds on stem/progenitor cell functions in the lung. Progenitor cells are isolated based on established protocols and brought into co-culture with fibroblasts to mimic the epithelial/mesenchymal communication that is required to drive alveolar repair. Organoids can be generated from cells of murine and human origin and co-cultured with healthy and diseased primary human fibroblasts to study disease-specific communication between cell types during repair. The impact of your investigational compound on organoid formation can be investigated. We have identified different processes in organoid formation, that can all be modulated by inhibition or stimulation of specific pathways. These processes include initial progenitor cell division, subsequent proliferative expansion and thereafter differentiation towards alveolar and airway organoids. Treatment scheme can be discussed depending on the target of interest, as treatments can be added at the start of each phase. Furthermore, additional disease stimuli can be discussed. Please contact us for more information on the different models and for a study design tailored to your needs! – Ng-Blichfeldt JP, Schrik A, Kortekaas RK, Noordhoek JA, Heijink IH, Hiemstra PS, Stolk J, Königshoff M, Gosens R. Retinoic acid signaling balances adult distal lung epithelial progenitor cell growth and differentiation. EBioMedicine. 2018 Oct;36:461-474. – J.-P. Ng-Blichfeldt , V. Guryev , P.S. Hiemstra , J. Stolk , M. Koenigshoff , R. Gosens. Myofibroblast Differentiation Impairs Ability to Support Adult Distal Lung Epithelial Organoid Formation. Am J Respir Crit Care Med. 2018;197:A7623. – X. Wu , E.M. Dijk , J.-P. Ng-Blichfeldt , S. Bos , L.E.M. Kistemaker , R. Gosens. 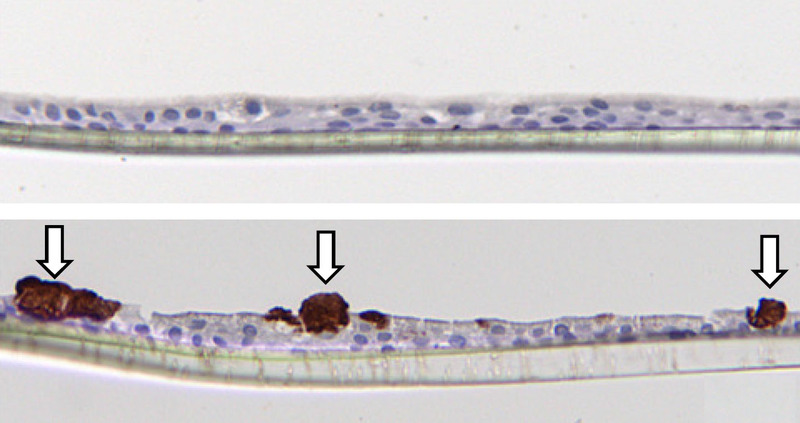 WNT5a/5b Signaling Represses Functional Responses in Lung Epithelial Progenitors. Am J Respir Crit Care Med. 2018;197:A7624.